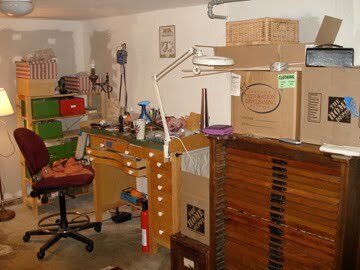 Lisa's Kitchen Sink: Call it what you will, just don't call it the garage!! Call it what you will, just don't call it the garage!! I've been in my new house & studio for a month now. In the battle of time my house has been the winner so today I'm shifting gears. My new jewelry digs are alas, located in the one car garage. We just bought a duplex and our tenant has a garage beside mine. She uses her's as her Letterpress studio so I have high hopes that we get positive creative juices flowing between our walls. Today's project was to photograph the setup of the space. 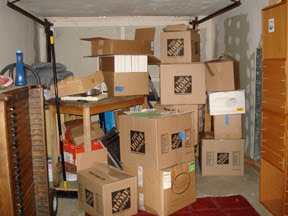 Ah, all projects have ulterior motives, mine was to create a reason to put things away and unpack a bit more and take to take the garage out of the garage. After painting every room in the house I have elected to wait out some time before I paint the studio. A student of mine from San Rafael inspired me to express the mood I desire while working through paint. Another day another project, I'm still young. So here goes... The Studio in Progress. My bead cabinet is my pride and joy. I purchased it about 10 years ago at an antique store for $500. 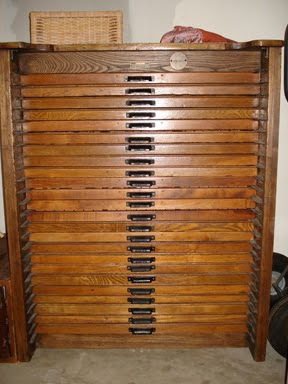 (Worth every penny) There are 24 drawers that measure 18" x 36". 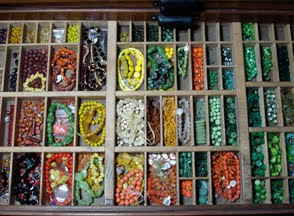 Inside are all my single bead treasures, clasp collection and lovely things to touch and behold. Each drawer is removable from the cabinet so I can spread out. Of course what thrifty beader could do without IKEA? 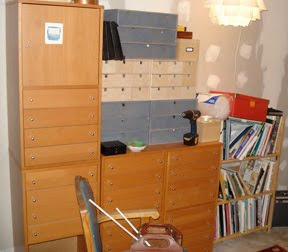 Each of these cabinets and wooden boxes came from that lovely DIY place. The little drawers served me well in the move. 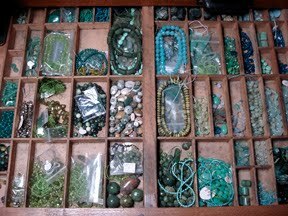 I labeled each drawer as to what mess was inside and just packed up all those loose beads, findings, chain, hoo-haas that seem to pentrate every crack and crevice of a beaders life. 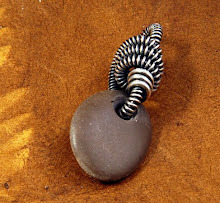 From the photo you may think everything is nicely put away but every good wire worker knows that there is often a mess hidden behind the embellishment. Then we have the jeweler's bench. I purchased this at Otto Frei years back for about $750. I LOVE my bench. I'll admit, a dining table works fine but there is something to be said about having a table top surface that no one else in the house would use. My tools love the bench too. Someday far, far, far away, when everything is organized, I will make a photo tour of all the tools that live inside it. And just like life, there is often a dark side. Behind all things cleared away and organized, I have a wall of boxes waiting for attention. Call it networking, communication, sharing, or a creative outlet; everyone knows this is a blog about understanding personal procrastinations and how we get to where we are. The hope is that we complete a few projects along the way.